This was one of the funny moments of last Thursday's UEFA awards ceremony where Lionel Messi won the player of the year award. There was a lot of media focus on Cristiano Ronaldo and Messi that most forgot that Luis Saurez was among the nominees, it is also good to know that Luis Saurez was voted second ahead of Cristiano Ronaldo in the award polls. 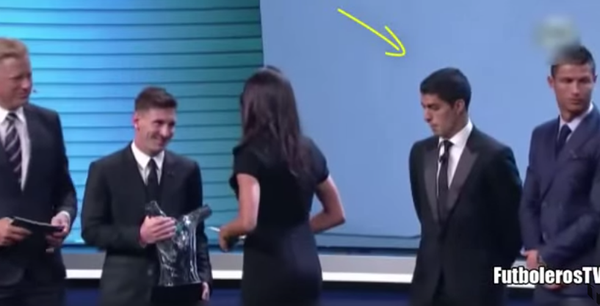 During Messi’s acceptance speech, the former Liverpool striker couldn’t help but avert his gaze, and was caught checking out presenter Melanie Winiger’s bum. Lol, Suarez could not help it.